Finding space for new machines in an already overcrowded shop. 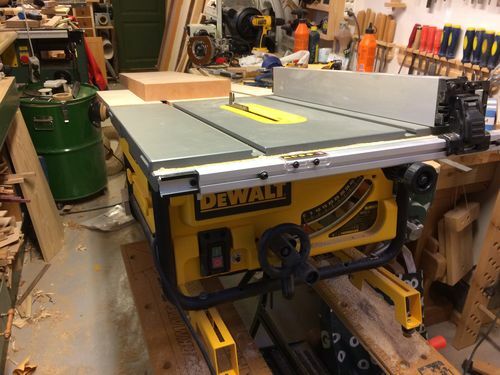 I recently bought a new DeWalt table saw even though I didn’t have room for it. My shop was already very crowded. My idea was (and still is) to get rid of my ‘Kity’ European style entry level 5 function combination machine. 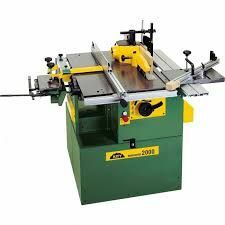 This machine has served me well over the past 22 years and is still in excellent condition, but I have always been a little frustrated that building saw table jigs for the type of work I do is extremely difficult and clumsy to use. in addition the max saw blade height is only 2”. I figured I could somehow make do until summer when I sell the the combi which takes up more than a sq. yard of space. Well, that didn’t work out so well! I wound up with my new saw in the only walkway through the shop mounted on my Work Mate bench. I bruised up my torso squeezing between the saw and the cabinets trying to get to the back of the shop. After a few days of this I decided that I would have to prioritize. I decided that I would have to move my Tormek sharpening machine to another place and then bolt the saw onto the top of the chest where the Tormek had been. This wasn’t ideal since the Bench I had to move the Tormek to is a bit too high for comfort. But I use the saw a lot more than I sharpen so there you go! This worked out real well. The cabinet is mounted on wheels and very easy to roll out when I need it. I can even leave it plugged in. Ok, I was a lot happier, that is, until my new DeWalt planer arrived!. First I put it on top of my combi machine, but that was too high and not a very good location for stuffing lumber through it. I moved it to the end of my rather larger work bench. Also not a good working location and too heavy for me to move when I wanted to use it. Then I just happened to glance at a little Ikea step stool that I have in the shop and thought to myself that I wish I had a small table about the height of that stool. Then I thought, why not just put a top on it and use it for the planer stand? Luckily I had an old, large and thick cutting board on my wood cart (also from Ikea) made from a very hard wood and about an 1-1/4” thick. It was a perfect size for my planer so I mounted it on top of the step stool, then mounted wheels on the back legs and skids on the front legs. Then I screwed the planer down to the top. Worked perfect and is stable, but easy to move around. I think I’ll just paint it green now to match my other shop stuff and call it a day. I keep it at the end of my bench next to my drill press and it’s totally out of the way now. 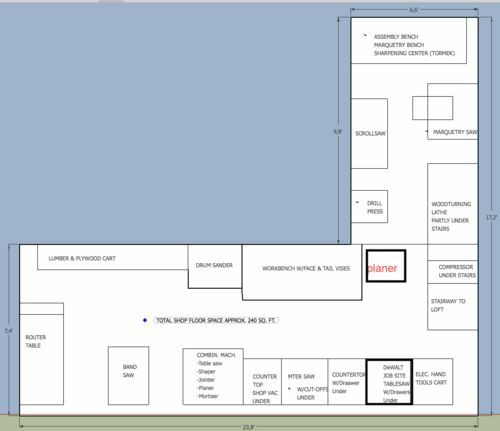 In case you don’t believe just how jam packed my shop is, here is the current layout. It is less than 8ft wide on the long part and 78” on the back ‘L’ leg. One real advantage to my small(ish) shop is that now that I’m older and not very mobil, not having to walk a lot in the shop helps me keep in the game. So a disadvantage turned to an advantage in only 22 years! I think the moral to this story must be ‘where there’s a will there’s a way’. Thanks for reading and don’t let anything stop you from buying the tools you want! Since building our smaller house a couple of years back, this has become my nightmare as well. But, all can be overcome if you just plan a bit….... good luck. That’s true Brian and if you have all your main tools on casters you can also rearrange to suit your current needs. My main criteria has always been that the machines must be placed so you can put long boards through them even if you have to move them a little or angle them to get that capacity. 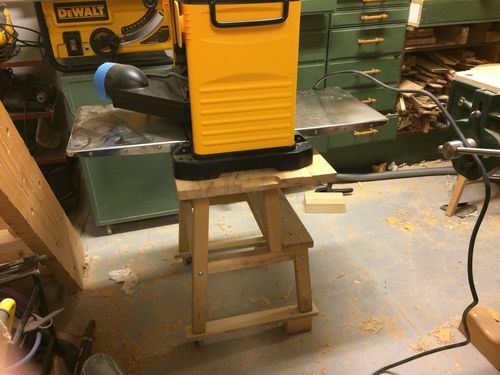 For example; my bandsaw currently sits in a position with the capacity to cut about a 1meter long board, but It is on wheels and I can pull it out in seconds and open my shop door to cut any length I want. 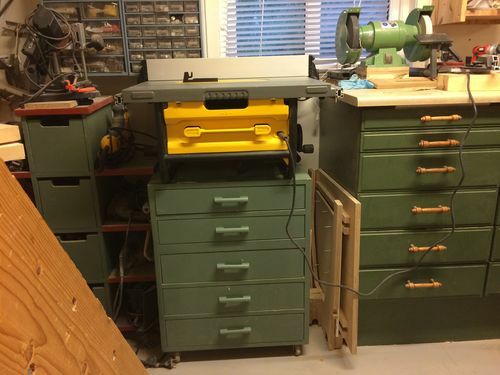 I had a large shop in the basement of our last house, but I had to downsize after we retired and bought a smaller place. My current shop is about the size of half of a two car garage, less the the center wall thickness of course. Quite a compact workshop Mike, but thoughtfully laid out to suit your needs. Glad to see that it has become “an advantage” for you. It would make it a lot easier to do other things with that space! Thanks John and Joe. Glad to hear that you are satisfied with your planer John. I’ve used mine a little and I like it too. I did think about making a flip top cabinet myself Joe, but I have no place for one and the chest of drawers the tables sits on is filled with my Tormek sharpening accessories. So, once again, a compromise. Glad to see you have things worked out Mike. I agree where there’s a will, there’s a way. I’m like you in a lot of ways. If I need, want or can use a new tool I find myself searching to where I’m going to place it. After only half of figuring it out I get the new tool and then find a place for it. It may take time shifting things around but eventually I find the perfect spot. I had a 733 planer for around 25 years. Finally upgraded to the 735. When I replaced the 735 to where the 733 was I kept bumping my leg on it. Finally I switched places with the drum sander and the planer and both fit nicely. Looking again at the second photo of your planer, with your drill press in the background, this reminds me of a setup that I have used a couple of times when I was handling longer boards by myself. 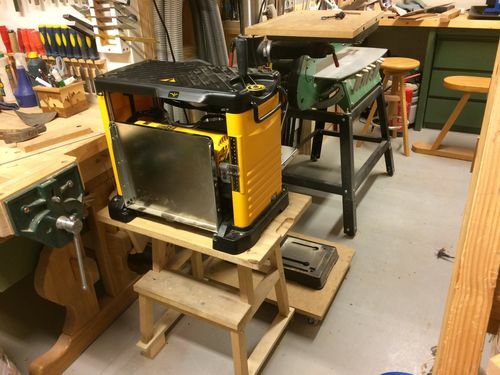 Using positioning similar to what your photo shows, I would set the drill press table height to match the planer output plate height, so that the drill press table would support the piece as it came through. 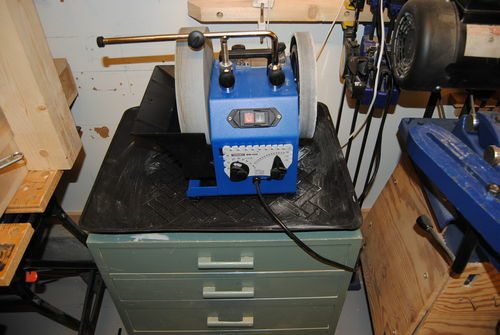 If I were doing more planing batches, I would clamp a roller to the drill press table to give a smoother transit. I find that this makes working on my own a bit easier. I have done similar things in the past John, but I won’t be able to use the planer in it’s present location. That’s why I made it easy to move. It takes up very little space I can use it in a lot of different locations depending on the length of the stock. I am planning to put a handle on the front to make it a little easier to steer around. It’s not beautiful, but it works! Oh the joy of having toys to play with!! Usually the rule of thumb is the more space you have … the more you can get to fill up that space! That’s worked for me, cause I’m a spoiled princess and have a very big workshop to play in. But I have to say, you’ve done a mighty fine job of setting up your toys Mike. What are you going to buy next?!! Hi Elaine. Probably an electric wheel chair the way it’s going. I’m surprised my wife lets me buy anything at all considering my very low capacity to do anything these days. Now that’s what I call true love! I am making a special project for my son right now building him a pair of speakers which is kinda fun and challenging. I just started today and I can’t wait to them finished. I even managed to get my shop cleaned up and organized yesterday, so you could say that I’m on a roll. I am looking forward to seeing some of your artful projects coming along in the near future from your (very large, yes I’m envious) workshop. I think it’s pretty much an universal problem. I’m working hard on reworking my shop at the moment. Creative and practical at the same time. Great that you’re staying in the game too, you’re an inspiration Mike! Thanks Smitty. You have a point there Wayne. I suspect if we didn’t feel the need to make stuff for our family and friends, in part to justify all the money we spend on tools, we would be just as happy to make stuff for our workshops that would look better than what we have in our living rooms!